Tomas Alfredson, best known for the Swedish vampire classic Let the Right One In (2008), adapts the John le Carre novel about British intelligence agents in the early 1970s trying to flush out a Soviet mole from among their ranks. Like the earlier film, this one has an airless quality, much of the action taking place in the hushed and colorless offices of "the Circus." But whereas the dank tone of Let the Right One In served to heighten the moments of poignance and shrieking horror, Tinker, Tailor, Soldier, Spy begins to seem phlegmatic after a while. Gary Oldman stars as Le Carre's resolutely bland agency man, George Smiley, and he's backed up by a top assortment of starchy, cantankerous Brits (John Hurt, Toby Jones, Ciaran Hinds, Colin Firth). Tinker Tailor Soldier Spy, The Devil Inside, and film events around town. 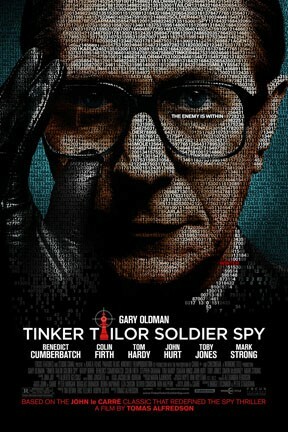 Tinker Tailor Soldier Spy is not showing in any theaters in the area.